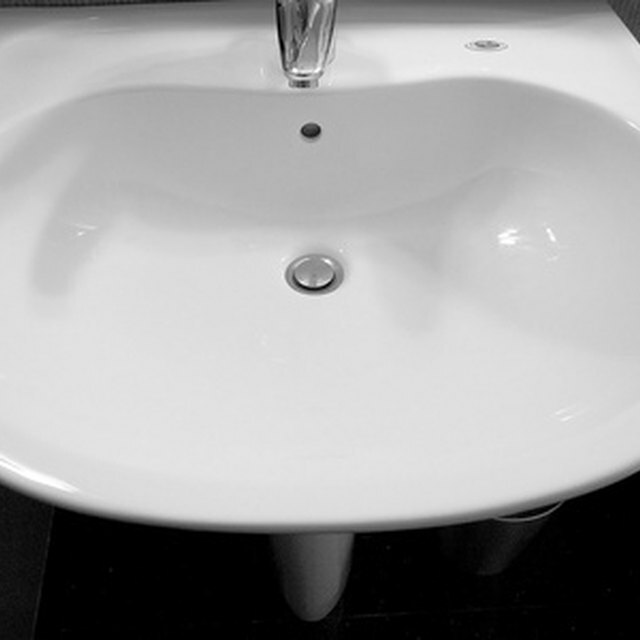 Porcelain sinks are an attractive and sturdy sink, but they can collect stains and soap scum over time. The stains will dull the finish of the porcelain. Home owners can easily return the porcelain to a high shine using simple stain removing and polishing techniques. Ingredients found around the home will accomplish the job in just a few minutes. Porcelain sinks should be shiny and bright. Pour 1 cup of borax and 1/4 cup of lemon juice into a bowl and mix them together to form a paste. Apply the past to any stains in the sink with a soft cloth. Use the cloth to gently scrub the stains until they come out. Rinse the sink with clean water. Line the sink with two layers of paper towels. Pour regular household bleach onto the paper towels until you saturate them. Leave them on the sink for 15 minutes. Remove the paper towels and rinse the sink with warm water from the tap. Buff the sink dry with a lint-free cloth, moving in gentle circular motions to restore the shine. Turn on the fan or open windows when handling the bleach.